Organically approved. Traditionally harvested sea salt crystals. Lots of flavour-take less salt. Free from anti-caking agents. 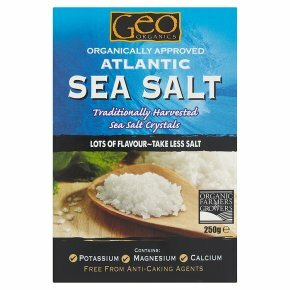 Suitable for vegans.This Sea Salt is traditionally harvested by hand from the Atlantic shores of Portugal and uses the same technique that the Romans used there centuries before. The salt crystals maintain the same form that nature gave them. The Environment This salt is raked by hand from coastal sea pans. This harvesting does not involve the use of any vehicles for extraction and therefore minimises the cost to the environment. Drying occurs by the natural use of sun and wind and does not use any chemical process. The sustainability of this resource has been managed for hundreds of years and continues to be harvested without the depletion of this natural asset.